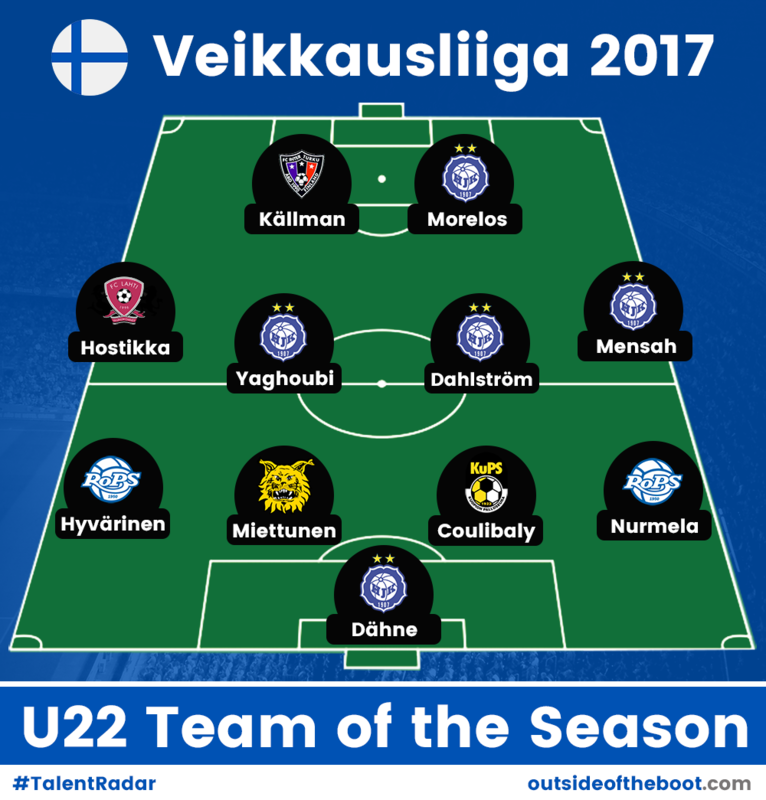 As the Veikkausliiga season has finished, it is time for us at Outside of the Boot to recognize the accomplishments of tomorrow’s stars under our Talent Radar banner, with the U-22 Team of the Season feature. The Veikkausliiga was dominated by a youthful and exciting HJK side, as they finished 20 points ahead of their closest competitor. Therefore it is only natural that almost half of the players in the team are from the Helsinki based club. However, there has been plenty of young talent throughout the league, who were vital for their clubs, whether they were gunning for a Europa League spot or ensuring they stay in the league. Thomas Dähne // HJK // 23 // Goalkeeper: The goalkeeper who signed from RB Leipzig in 2015 has kept 14 league clean sheets in 22 matches, helping HJK to win the league. He topped the clean sheet charts alongside Mika Hilander of Ilves despite playing eight matches fewer than him. The goalkeeper has represented Germany from U16 to U20 level a combined 16 times. Dähne’s understudy, 20-year-old Markus Uusitalo was also impressive, coming sixth in the charts with seven clean sheets from just 12 appearances. Anselmi Nurmela // RoPS // 20 // Right Back: Nurmela has been an important player for Rovaniemi, starting 24 matches and coming off the bench five times, although some of those appearances have been in defensive midfield. The 20 year old got one goal and one assist and was involved in seven clean sheets. He has a combined 14 caps across Finland’s youth teams and one goal. Hamed Coulibaly // KuPS // 20 // Centre Back: The centre back from the Ivory Coast started the season out of the team at KuPS. He was actually loaned out to Kakkonen Group C side SC Kufu-98, where he played four matches before returning to the Kuopio based side. However, when he returned he became a mainstay, completing the full 90 minutes in 21 matches, ending the season with two goals. In the 21 games he played KuPS conceded a respectable 23 times, although they kept three clean sheets on their way to a second placed finish in the league, earning themselves a place in next year’s Europa League qualification rounds. Tatu Miettunen // Ilves // 22 // Centre Back: Finnish centre back Tatu Miettunen started 28 times for Ilves, coming off the bench once. Of the games that he started, Ilves managed to keep 10 clean sheets and he also scored two goals and got one assist, which helped the club get third place in the league, only behind KuPS on goal difference, a placing which has earned them a Europa League place. One of his two goals was the winner against strugglers JJK Jyväskyla, which eventually won them the game after they had gone 1-0 down early on. Miettunen has one cap for Finland U21s to his name. Juho Hyvärinen // RoPS // 17 // Left Back: At 17 years old Juho Hyvärinen is the youngest member of this team. Like his Rovaniemi team mate Anselmi Nurmela, he has versatility on his side as he has also played on the right and left wing this season. Overall Hyvärinen has had 15 starts and three appearances off the bench this season, scoring one goal, which earned his side a point against JJK Jyväskyla and assisting once. He has got nine caps for Finland U17s and one for the U18s. Evans Mensah // HJK // 19 // Right Winger: When 19 year old Evans Mensah arrived from Ghanaian side Inter Allies for around £90,000, a lot of HJK fans won’t have known what to expect, but after a season in Helsinki they certainly do now. The youngster who can play both on the left and right wing started 22 matches and came off the bench seven times, scoring eight goals and getting four assists. His best game of the season came against JJK Jyväskyla, where he scored twice and assisted once in a 4-0 win. A sign that Mensah’s performances have been impressive is that he was called up to Ghana’s national team for their African Cup of Nations qualifier against Mozambique, however he is still waiting to make his national team debut. Sebastian Dahlström // HJK // 21 // Centre Midfielder: Dahlström came through the HJK academy and has been becoming a more vital part of their team each season. This year he started 19 matches and came off the bench seven times, scoring three goals and assisting seven, which is a good return considering he is often deployed as a holding midfielder. Dahlström’s best game came when he assisted twice and scored once in 6-0 win against SJK. As well as being good going forward Dahlström is strong defensively and played a big part in the 15 clean sheets that HJK kept while he was involved. Moshtagh Yaghoubi // HJK // 22 // Centre Midfielder: Yaghoubi may have only started 13 times and come off the bench three times for HJK this season –mostly due to an ankle injury- but he has been impressive. The midfielder has made four assists in the league and scored twice. However, what shows how well he has played when fit is that unlike any other player on this list, he has managed to get onto the pitch for his national team. Finland head coach Markku Kanerva gave him his debut this season and Yaghoubi has been involved in three games for the Finns and even played 90 minutes in a 2-1 loss against Ukraine in World Cup qualification. Santeri Hostikka // FC Lahti // 20 // Left Winger: In 26 starts and four appearances as a substitute Hostikka managed to get three goals and seven assists. The Finland Under 21 international is able to beat players with his pace and deliver delightful balls with both his left and right foot. Lahti managed to secure a Europa League spot and Hostikka was an important part of that achievement. He also won Veikkausliiga Player of the Month in July. Alfredo Morelos // HJK (moved to Rangers) // 21 // Striker: He may have moved to Rangers halfway through the season, but Alfredo Morelos finished the season as the 7th top scorer in the Veikkausliiga and the top scoring player under 22. The Colombian -who has scored seven goals in six Under 20 games for his country- clocked up an impressive 11 goals in 11 starts for HJK which then earned him a £1 million move to Rangers in June, having only signed permanently for HJK for £450,000 in January. He was also Veikkausliiga Player of the Month in both April and May. Since joining Rangers, Morelos has scored six goals in 12 league games at the time of writing. Benjamin Källman // Inter Turku // 19 // Striker: The 19-year-old Finnish forward is a real danger in the box, as he showed HJK when he converted Inter Turku’s equaliser just three minutes after coming onto the pitch. Källman is imposing in the air and good with his feet and is a real poacher. Overall he has nine goals and three assists in 1,810 minutes of football, meaning he is involved in a goal every 150 minutes, which is impressive for someone who is still so young. He hasn’t represented Finland’s national team yet, but has two goals in two Under 21 matches, so could break into the full team in the near future.